Earlier this summer, I got the opportunity to attend the thirtieth annual conference for the Association for Welsh Writing in English (AWWE). 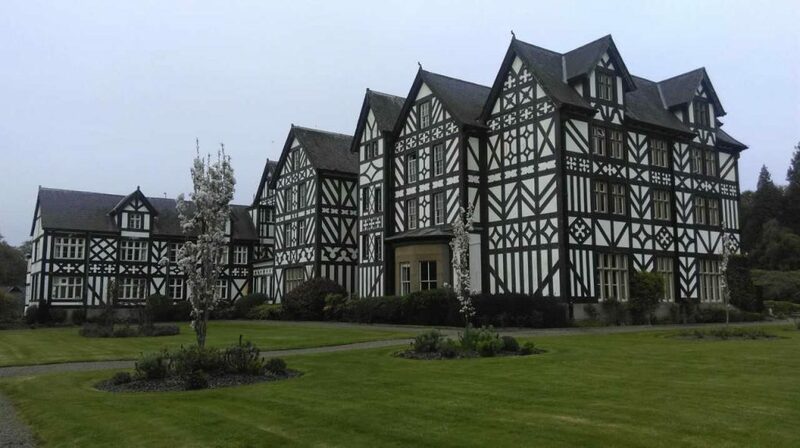 The conference was held at Gregynog Hall, a beautiful country mansion near Newtown. I had heard from friends who had visited before about Gregynog’s beauty, but that hadn’t fully prepared me for just how stunning it is in real life. While at the conference, I spent a good portion of my time just exploring the grounds and halls, which are worth a visit in themselves. That said, the AWWE conference was the reason why most of the people visiting Gregynog were there in the first place. The conference was arranged to take place over the course of three days, starting on Friday and ending on Sunday. 2018’s conference theme was ‘Home / Cartref’, and all the papers and performances had to relate to this topic in some way. The first day opened with the AGM and a publishing workshop, followed by an opening keynote lecture by Professor Bella Dicks, head of research at the National Museum. This was followed by a book launch for Margiad Evans’ Creed, published by Honno Press, and a new book edited by Professor Jane Aaron, Cambria Gothica. After dinner, we were treated to a performance of ‘An Extradordinary Female Affection: At Home with the Ladies of Llangollen’ by Living Histories Cymru, an organisation that ‘brings to life’ the histories of LGBT people around Wales and the border. In the evening, there was a late-night, pop-up bookshop, which sold books by various Welsh writers – including several who were attending the conference. The next two days were taken up primarily by parallel sessions of talks, grouped into panels of two or three people, according to the subjects of their papers. I wasn’t able to attend all the panels, since a lot of them were taking place simultaneously, but those which I did see were well-presented and fascinating to listen to. Among my favourites were Aiden Byrne’s ‘”Baron of Beef”: Foreigners, Interlopers, Homes and Domesticity in Welsh Writing in English’ and Amber Hancock’s ‘Historic Parkouring with Raymond Williams: Orientating One’s Identity at Home within People of the Black Mountains’. For anyone with an interest in the academic side of Welsh writing in English, the conference was a rather star-studded event. As someone who has done a few assignments on Welsh writing, it was a bit startling to run into people I had cited in such a casual setting, like the tea room or the toilets. Yet regardless of anyone’s professional status or level of education, everyone I spoke to was remarkably welcoming. Despite being an undergraduate in a room full of doctors, professors, and PhD candidates, I was never made to feel like an outsider. On the contrary, being able to speak to people with long careers in the academic field was one of the best experiences of the conference. Just being able to talk to people with knowledge and – more importantly – enthusiasm about their subject was enlightening. The AWWE annual conference was a joy to attend. The location was beautiful, the people were welcoming, and the papers were informative. Attending the AWWE – or perhaps, more broadly, any conference at this level – is an experience that I would highly recommend to other students at UWTSD, should they get the chance to go.